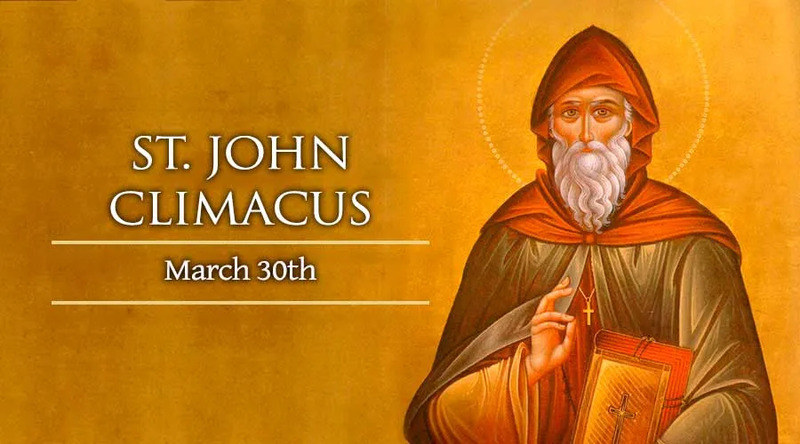 St. John Climacus was born around the year 525 in Palestine. As a youth, he excelled in his studies and was highly regarded by his peers for his knowledge. At the age of 16, John decided to leave the world and retired to a hermitage near the base of Mount Sinai. For the next four years, John spent his time in prayer, fasting, meditation and discernment while preparing to take solemn vows to the religious life. Through the direction of Martyrius, John curbed his vices and worked to perfect his virtues. After professing his solemn vows, John began to spend more of his time studying scriptures and the early fathers of the Church. He became very knowledgeable in these subjects but his humility caused him to hide his talents and not presume to share them with others. Near the end of his life, he was encouraged to share his knowledge with others and wrote the "Climax" also known as "The Ladder of Paradise." This work was a collection of sayings and examples to illustrate how to live the monastic life. From this work, he received the name Climacus, a derivative from the Latin root for climax or ladder. As John progressed in years and wisdom, many of the religious living on Mount Sinai began to seek his advice in spiritual matters. He freely offered his advice and was highly regarded for his wisdom and holiness. Around the year 600 the abbot of all the religious in the region of Mount Sinai died and John was chosen to replace him. John ruled until his death in 605 and always tried to lead through his own example.